For its Rendez-vous #02 COSA, with Perrot Richard Architectes, presents in-situ the N°150 project: redevelopment of more than 20 000 sqm, avenue des Champs-Elysées, into a five-star hotel, shops and a cinema. COSA’s 156 housing units in Saint-Ouen project, design with Pourquoi pas! architectes, is shown at the Pavillon de l’Arsenal during an exhibition about the RATP Group approach. 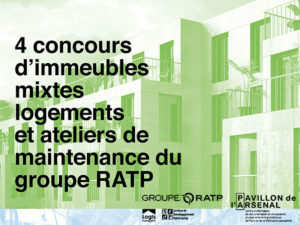 The exhibition, will show 18 other projects for 4 consultations on mixed-use buildings (housing and maintenance workshops) by the RATP Group. 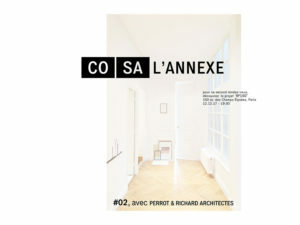 Grenoble Ernest Hareaux schools group, conceived by COSA was shown at the Maison de l’Architecture de l’Isère, during the Saisons d’Architecture. 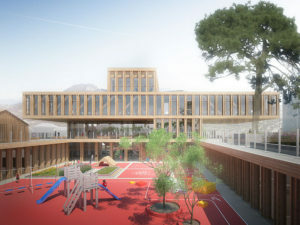 Competition for the J.Bruant schools group in Vaulnaveys le Haut, the Goncelin childhood centre, and the Villancourt schools group in Pont de Claix were also exhibited. COSA presents at the DVVD’s’Causeries’ one angle of the office system : the no-design. COSA, invited by Groupe Legendre, presented its hotel + para-hotel complex in the Bassin à Flot: a mixed program taking part in the ‘negotiated urbanism’ process led by ANMA, the city of Bordeaux and Bordeaux Métropole.